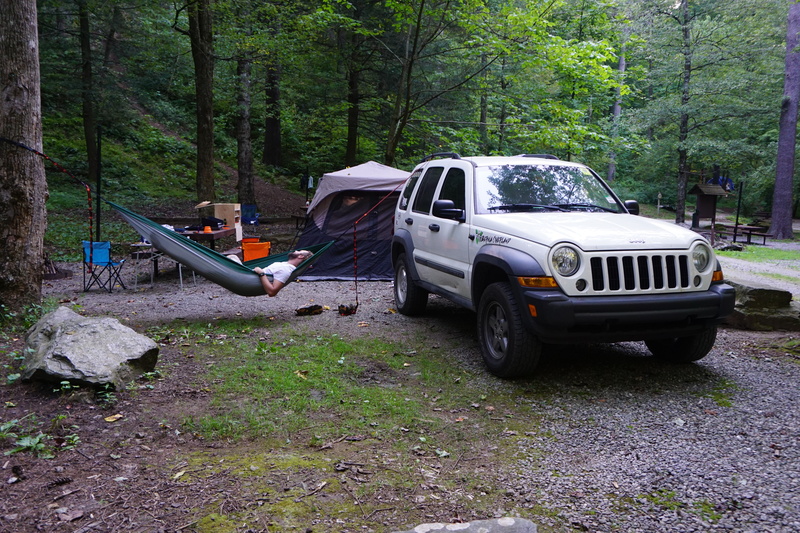 Spring is here and it is time to pack our tents and hit the road! Will you bringing your dog along for the ride? 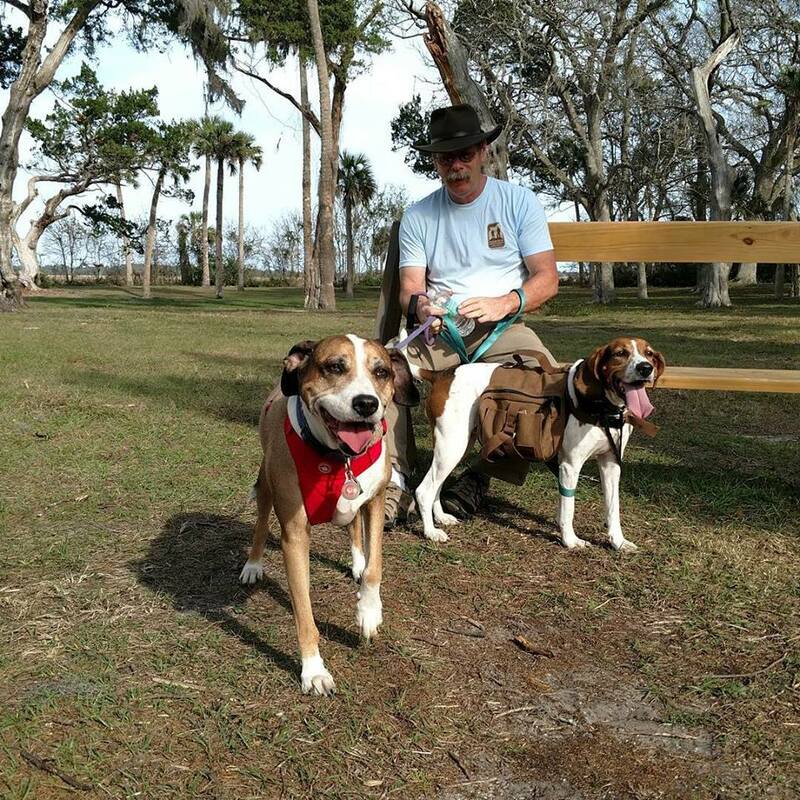 Our fur legged hikers are a part of our adventure family and we want them to come along when exploring the great outdoors. But, just like kids, bringing dogs along comes with its unique set of challenges. 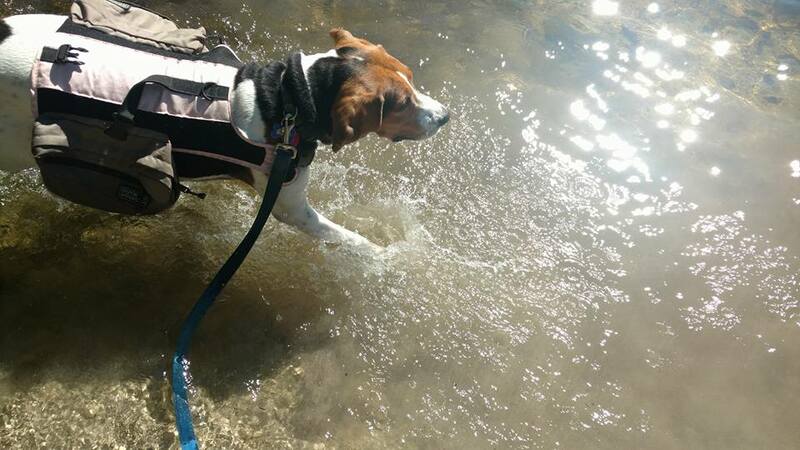 We often travel with our hounds, and we can say from personal experience, bringing a furry creature with you can be both frustrating and full of mishaps. 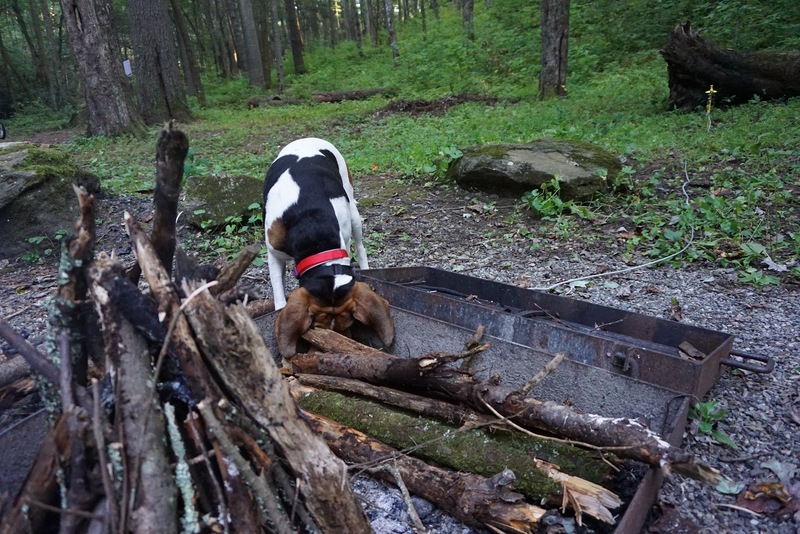 However, we are here to help by providing you a list of items that will make the experience easier on everyone when camping with your dog. Just call me Captain Obvious but a tent / hammock is probably one of the most essential items you can bring along. Please be mindful, that my hammock experience is very limited, as such I will not comment on how to hammock camp with a dog. As for tents, it is important to remember to have a tent large enough for yourself, your tent mates and your dog. Before camping with your dog, make sure to introduce your dog to the tent so they are familiar with it once you are in nature. Also, remember to never leave your dog outside alone in a campsite, especially in areas that wildlife is very active. Carrying a leash is actually part of the law in most public lands you will head to. Research where you are going, some places put specific restrictions on what kind of leash you can use. I strongly warn against retractable leashes, they do not give you enough control of your dog and can be potentially dangerous if they snap. A regular, old fashioned leash will do fine. As for collars vs. harnesses it really depends on the dog. I heard harnesses can make a dog pull more, but you don’t have to worry about them pulling themselves out of a collar. If you really want to go DIY on this subject, you can even make your own leash and collar out of paracord. Can’t go wrong with a Petco Sport Dog Leash on my Amazon Affiliate Store. Like this photo, visit my Store to buy it. I also like calling this a “saddle pack”. I mean, it does make your pet look like the cutest little pack mule, doesn’t it? What I love the most about saddle packs is that it makes your dog believe they are doing a “job”. Not only was she carrying necessities, which would be water, a bowl, and poopy bags for the trail, but it gave her something to focus on besides another dogs scent, or squirrels if you are on the trail. This is advised I first ignored myself and paid for later. One day we were hiking one of Florida’s famous, sandy, palmetto filled, trails, when I stepped on a rock and slipped, taking the innocent hound with me in the crash. Both of us ended up with gashes and decent sized bruises. Since Flonne, my hound, was wearing her backpack, dirt ended up getting into her wound, and was hard to keep clean with regular First Aid supplies. Of course, she ended up being fine with a nice cleaning at home. 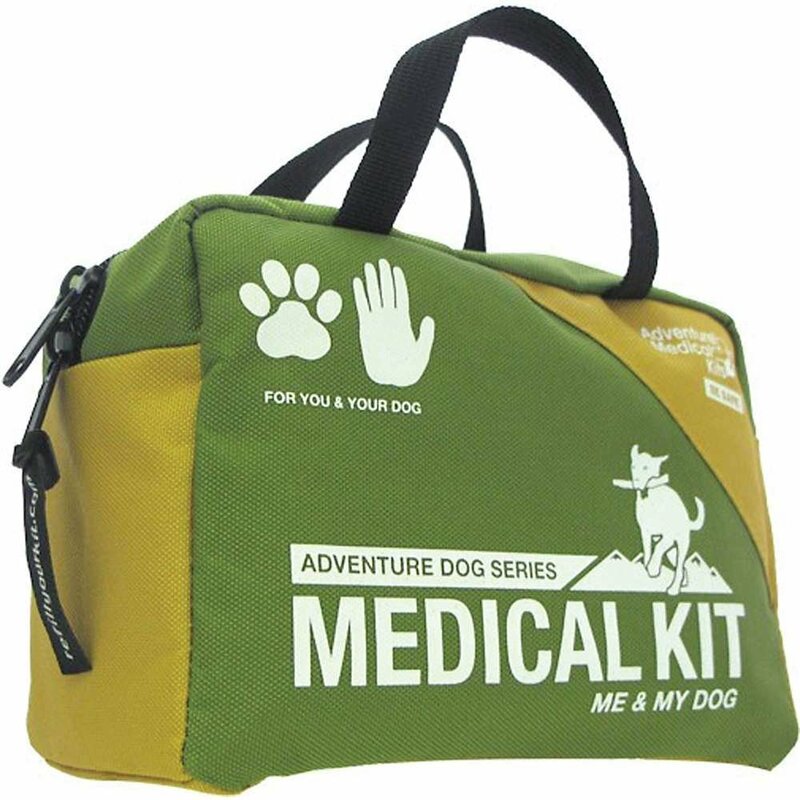 Bring a First Aid kit not only for yourself but also a dog kit that has the right equipment to keep your dog’s wounds free of dirt as well. As I learned, human bandages do not do much when fur is involved. 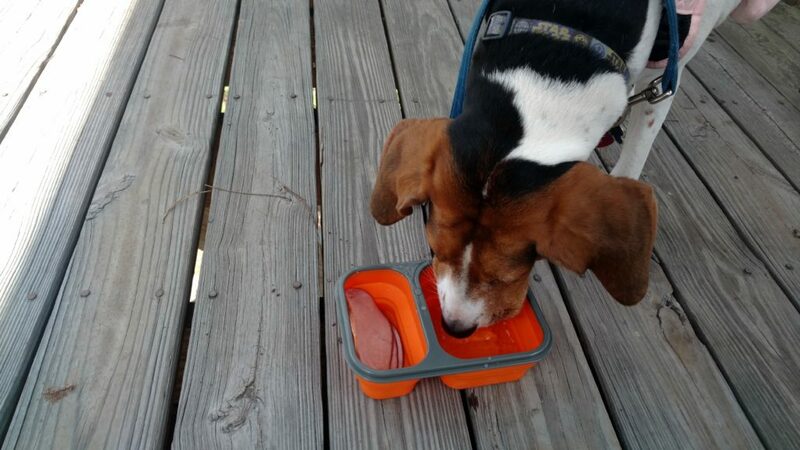 Just like humans, after a long hike dogs need to replenish their calories. Also, like humans this is generally done through food. 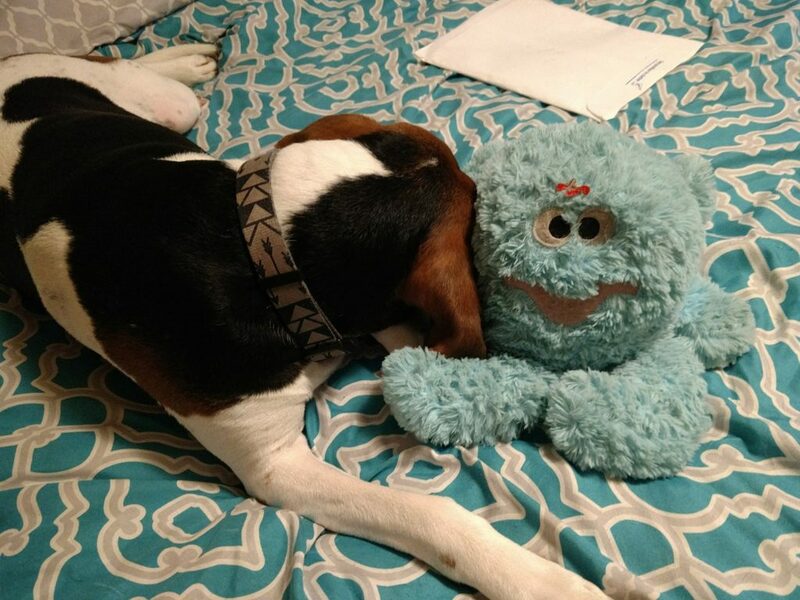 Unlike us, many of our furry friends aren’t the biggest fans of gobbling down food in strange environments unless it is the yummy goodness of whatever we are eating. However, that yummy goodness of human food is not always the best for them. Canned food, which most dogs find more palatable than dry food, is also very heavy and not the best choice when going camping. So I would suggest carrying some chicken stock with you, mixing it with water and putting it in their food. It will soften the food a little and making it more delicious smelling. I will keep this one brief since I hope you thought of bringing water before camping with your dog. Of course, there is the option of bottled water, however, those are bulky and not the most environmentally friendly choice on the trail. Having a water carrier is great for being able to refill your water at rest stops and keeping cost down. Also, think about bringing a water filtration system. Since we mainly have our Jeep with us we haven’t been in need of one since we are generally close to civilization, however, once on the trail water filtration becomes a necessity. Sleeping bag when hiking, Who would have thought! But really, your dog would like to sleep somewhere comfortable as well. You know that really old sleeping bag you’ve had for the last 20 years hiding in your closet? Yup, that one. Bring it along for your dog. Not only is it somewhere comfortable to sleep, but it also smells like you in an area of strange smells and possibly scary noises. 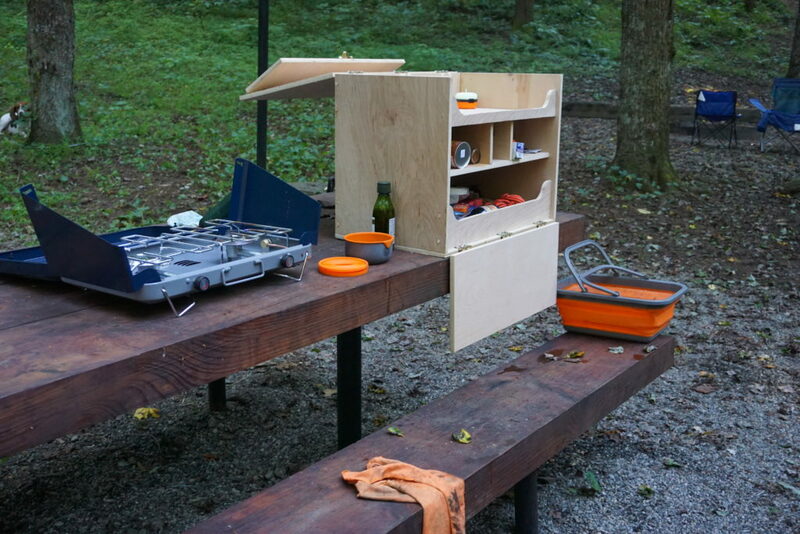 Such as Yogi, asking about possibly picnic baskets that have not been properly stored while camping with your dog. I touched on this before when talking about the sleeping bag. Some dogs are going to be super excited and happy to go on a road trip or a long hiking trip, some dogs are not going to be as pleased. 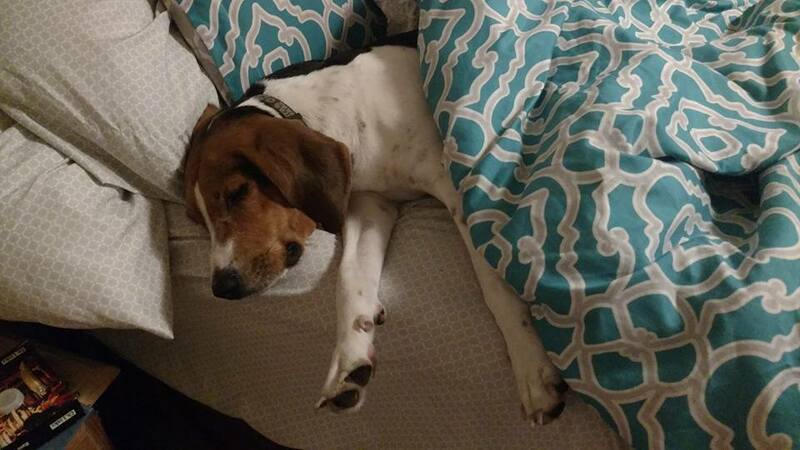 Both of our hounds have some issues traveling, one refuses to eat and the other gets nervous. Each pet is unique when it comes to treating nerves away from home but having a familiar item is one way to bring them calmness to the campsite. Personally, we have a dragon, that is Flonne’s travel buddy. He generally hangs out in the Jeep unless we are refreshing the scent. It may not be her Dragon but her Patchwork Pet Pastel Octopus gets an honorable mention on our Amazon Affiliate Store. Get your dogs microchipped! Honestly, you never know what may happen and dogs can get lost. The microchip allows a shelter quickly identify the owner and get your furball back home. Thank you for the kind words! I checked out your Instagram. Your cats are so cute, I had to give you a follow. Please, continue to check in. I have some more great photos and articles about hiking and the hounds soon! Looks like so much! I’m from Colorado and literally haven’t been camping in over 15 years! Thank you for the inspiration, great pictures!